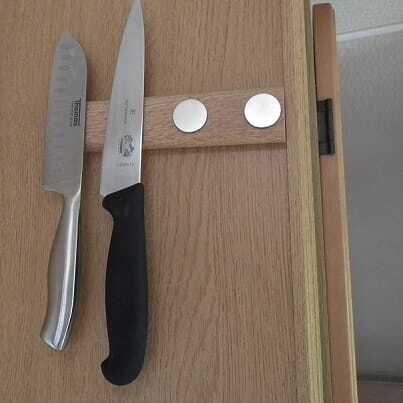 Magnetic knife racks are just as useful in a caravan or campervan as they are in your kitchen. When space is at a premium, magnets can be used to create bespoke solutions to fit any area. When Sue from Bedfordshire approached us with her dilemma we were only too happy help. Sue, an avid cararvan’er and camper, was unable to use a regular magnetic knife rack in the miniature kitchen in her caravan as there was simply not enough spare wall space to attach one. Sue was also cautious of drilling holes or screwing screws into the internal walls of her caravan and was looking for an alternative. When Sue phoned through to ask us if we could recommend a solution, it was obvious to our team of technical experts that strong, self-adhesive neodymium disc magnets where the perfect choice. Sue was able to locate a spare piece of beech-effect wood that matched the interior wall of her caravan and by using strong adhesive to fix the wood block to the wall, she was then able to place four 25mm diameter x 2mm thick self-adhesive N42 neodymium magnets on to the block. Each of these magnets is able to support 3.7kg in a vertical position or 0.6kg in a sheer position, more than enough to securely hold a regular kitchen knife. Sue was kind enough to send us these photos of her newly installed, bespoke knife rack in her caravan to show how another tricky situation can be solved using magnets and a little ingenuity.